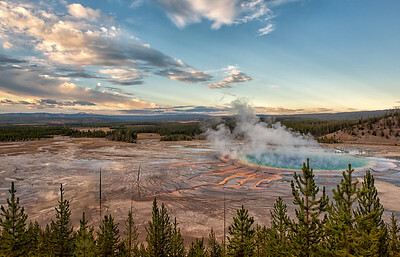 Walkers strolling along the Boardwalk in the Yellowstone's Midway Geyser Basin. 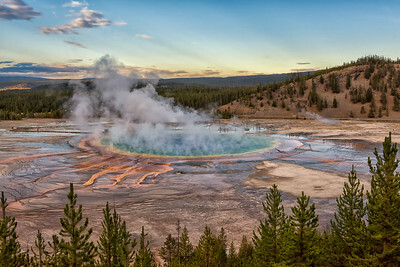 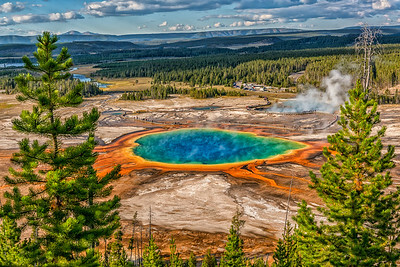 The Grand Prismatic Spring is one of the most colorful and captivating sights in the world. 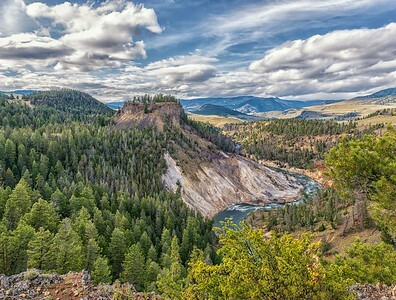 This is the view from the new Viewing Platform of this amazing hot spring, largest in the U.S. and 3rd largest in the world. 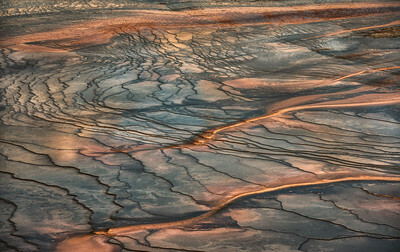 A slice of the colorful warm water runoff from Yellowstone's amazing Grand Prismatic Spring. 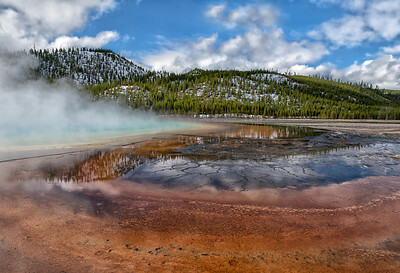 The vivid colors in the spring are the result of microbial mats around the edges of the mineral-rich water. 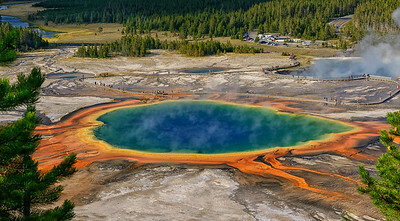 The multicolored layers get their hues from different species of thermophile (heat-loving) bacteria living in the progressively cooler water around the spring. 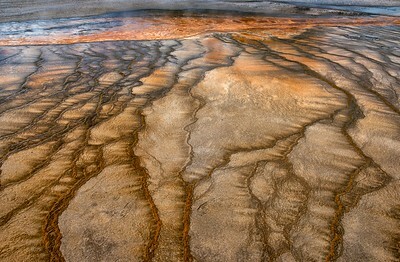 Runoff from the Grand Prismatic Spring. 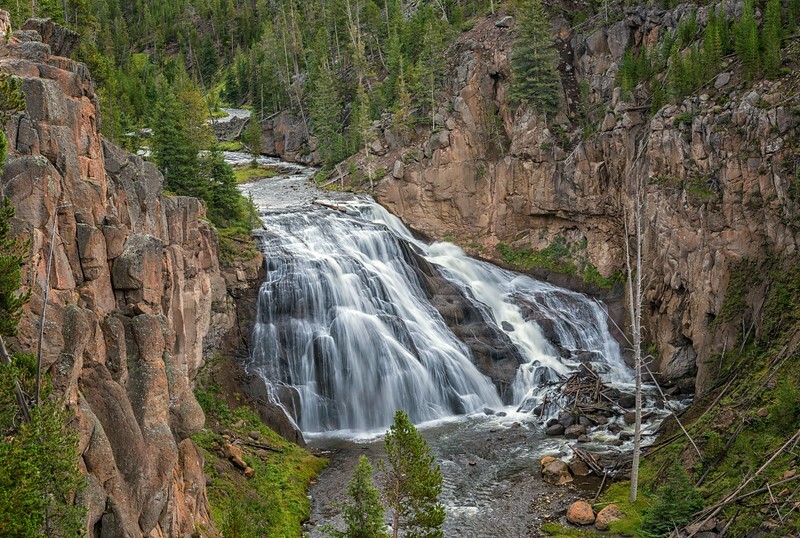 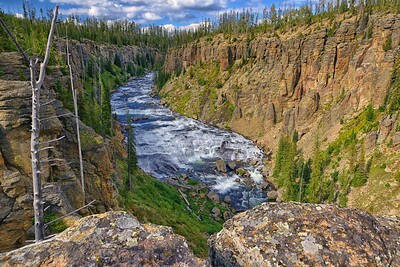 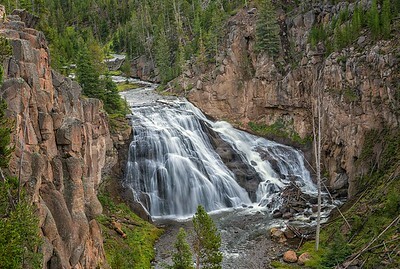 Yellowstone's Gibbon river plunges 84' on it's way to joining the Firehole river at Madison Junction. 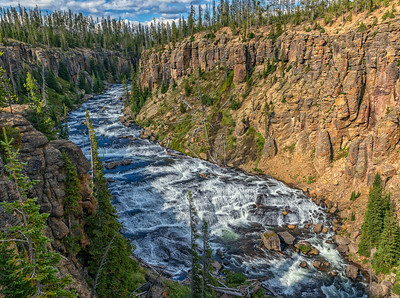 Yellowstone's Gibbon River flows 84-foot (26-meter) over remnants of the Yellowstone Caldera rim after a light snow had fallen. 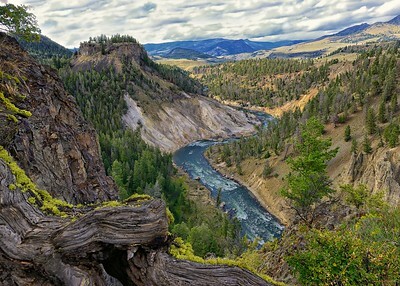 A favorite Yellowstone scene, with the Yellowstone river curving around Bumpus Butte and Calcite Springs. 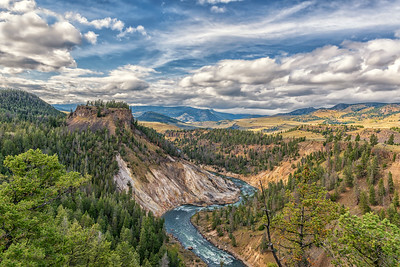 Looking north as the Yellowstone river flows past Calcite Springs with Bumpus Butte above. 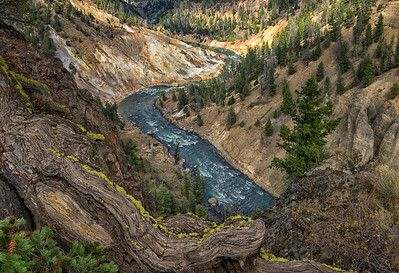 Looking over this twisted tree root at the Yellowstone River as it flows by Calcite Springs. 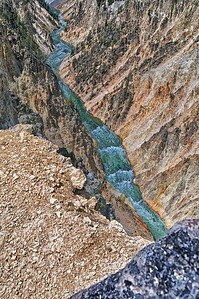 Looking down on those looking down from the viewing platform as the Yellowstone river rushes over the brink. 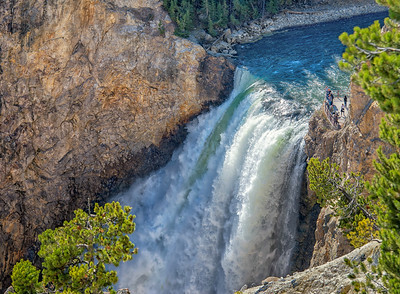 Looking downstream from the Lower Falls of the Yellowstone river viewing platform. 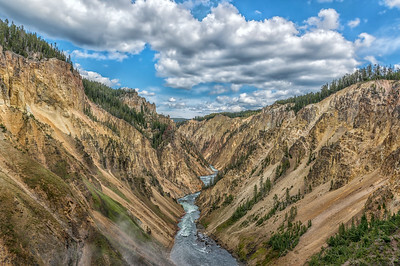 A thrill to stand here and feel/hear the power of the river's plunge while marveling at the river's creation through this unique geology. 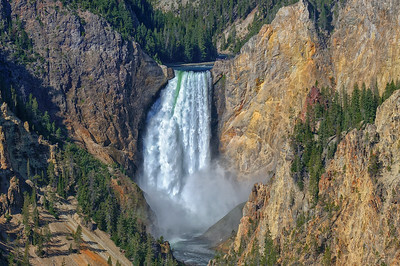 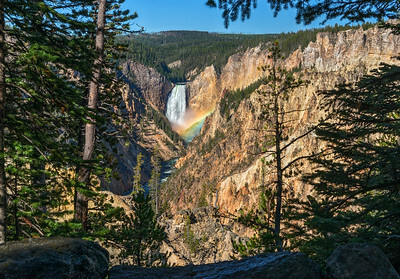 A long look of the wonders that the Yellowstone River has created over millenia. 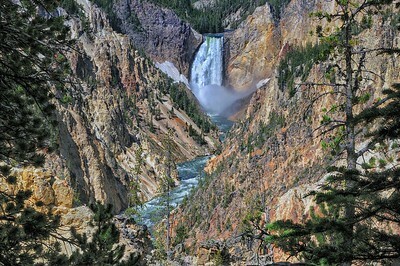 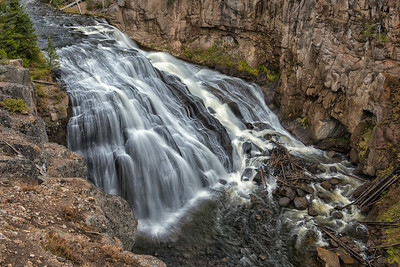 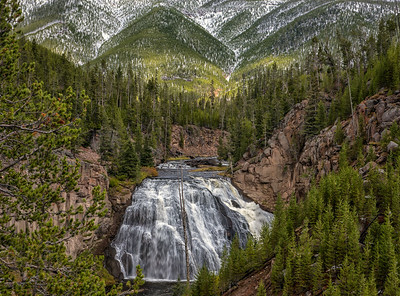 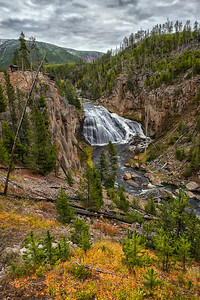 The Lower Falls in the distance. 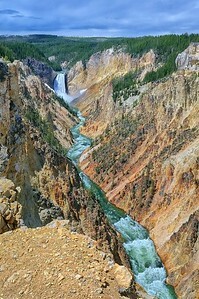 Looking down on the river that carved the Grand Canyon of the Yellowstone. 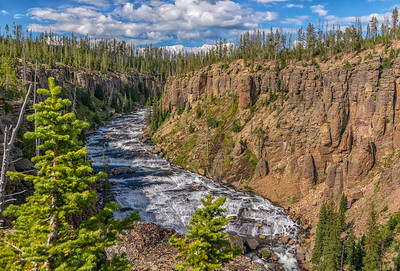 Looking upstream at the canyon that the Lewis River has carved. 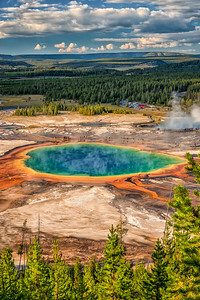 Some mineral pools on the to of the Mammoth Hot Springs Terrace. 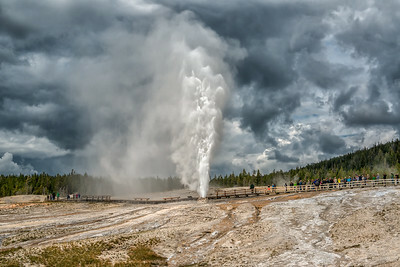 A side view of the multilevel terraces that flow under Canary Springs, the largest spring at Mammoth Hot Springs.